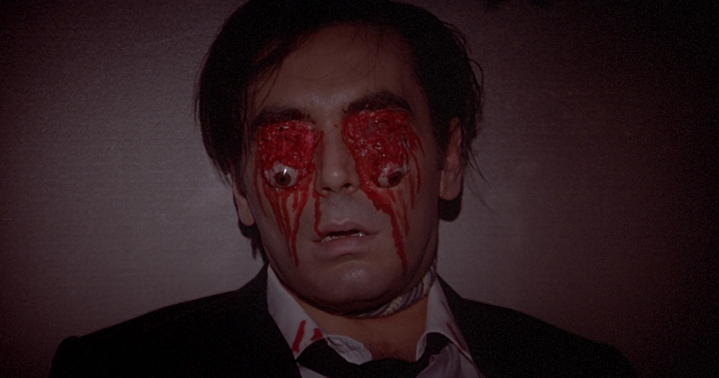 No one shoots a kill scene better than Dario Argento. We’ve reviewed six Argento movies on Mildly Pleased now and it never fails to amaze me how much work goes into the demise of an Argento character. Here’s an example in today’s film Inferno. A woman after being attacked takes shelter in a neighbor’s apartment. She tries to relax in a sealed bedroom and puts on an opera record. As the music plays, we cut away to a pair of gloved hands—a classic Argento touch—making children out of paper and then cutting their heads off with scissors, we cut to a pet lizard eating a moth. We cut back to the woman as the power in the apartment goes off and on, the music cutting out with each flicker. She hears a noise and opens her door. Her neighbor friend enters with a knife lodged in his neck. The unseen gloved figure then proceeds to stab the woman repeatedly in the back to the tune of the opera music. That’s how you do it. Inferno may not be an instantly recognizable title to your casual horror fan but it is important in the career of Argento. That’s because it’s part of Argento’s “Three Mother’s Trilogy” which is a trilogy of film’s centered around three witches who secretly manipulate the world to cause evil and chaos. Suspiria is the first film, Inferno the second, and The Mother of Tears completed the trilogy in 2007. What I love about this series—at least in the films I’ve seen—is that it approaches this evil in small self-contained films. In each installment, the witches are hiding away in different countries. You wouldn’t even know they exist into you delve deep into the mystery and Inferno digs much deeper than Suspiria. Right away we are introduced to Rose Elliot (Irene Miracle) in New York City reading a book entitled “The Three Mothers” and learning about the evil sisters. She learns that the Mother of Sighs, lives in Germany (Suspiria), the Mother of Tears, lives in Italy (The Mother of Tears), and the Mother of Darkness not only lives in Rose’s home city of New York but might be living in her very apartment complex. Rose investigates and after almost getting killed and discovering a corpse in the cellar, contacts her brother Mark (Leigh Mccluskey) in Rome to help her. Mark reads Rose’s letter about the Three Mothers but leaves it in a class where his friend Sara (Eleonora Giorgi) finds it. Sara, also fascinated by the Three Mothers story, goes to the library to find a copy of the book. She does and is not soon after attacked by a mysterious figure and meets her demise in the scene that I described in the opening of this review. This movie doesn’t waste any time with the kills. I could proceed with plot points but its more of the same. A person finds a clue, gets killed, someone else picks up where they left off, etc. It’s fun though there’s not much to it. Of course, there’s the mystery to who is actually the witch but I found myself far more interested in seeing how certain characters were going to die then who the witch is or what she wants. It’s also strange how easy it is to defeat her after hearing the story of her and her sisters being in power for so many years. Though I guess it’s not so much that they were these all-powerful beings than the fact they were secretly manipulating the world. It’s cool I just thought there would be more of a showdown. There is a lot of fire though. Just in case you wondering if they cashed in on that title. The gory Giallo storyline is familiar territory for Argento. Where this film stands out is its lighting. 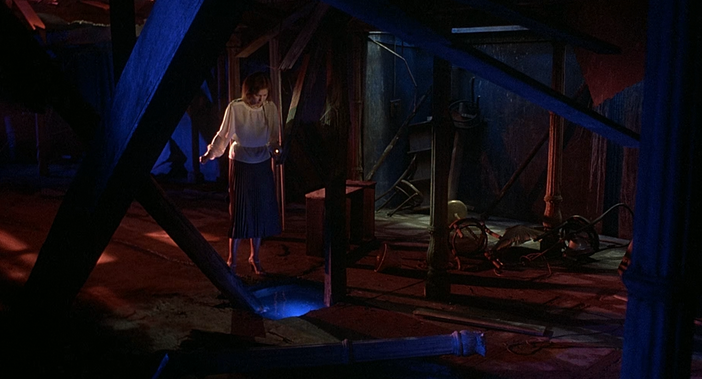 You’d be hard pressed to find a scene that doesn’t have a red or blue light off to the side. Almost to the point of where it’s distracting but still cool. Another thing that’s distracting but still cool is the film’s dizzying soundtrack by keyboard king Keith Emerson of Emerson, Lake & Palmer. It’s not far off from the kind of funky synth soundtrack Argento’s usual collaborators Goblin would do just higher energy and with opera on top of it. This film can be an assault on the senses but when it works it works. Inferno isn’t must-see Argento. There are good kills (not his best kills), good visuals (not his best visuals) and good music (not his best music) but it’s still an entertaining film with an easy to follow mystery and quick pace. 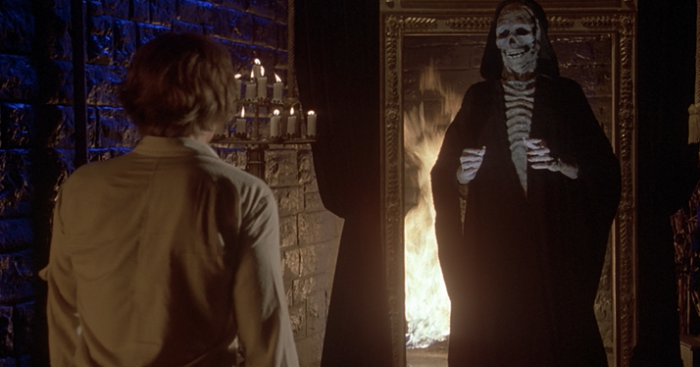 Inferno is like Diet Argento. It gives you some of what you want but still feels like a lesser product. That being said, if you find yourself with a burning desire to watch a Giallo film, check it out.